While Peter and I can delve deep into the esoterica of the Postural Restoration Institute’s tenets and methods, some of the lessons we’ve learned from our foray into PRI are astoundingly simple and profoundly effective. One of the first realizations we had is that it can be physically challenging to do a long, full exhale, pause five seconds (or more), inhale through the nose, and repeat for four more breaths–regardless of whatever position we’re in. Seemingly rudimentary PRI exercises like the Modified All Four Belly Lift (video below) challenged (and in many cases continue to challenge) our core muscles more than common “core exercises” such as plank and Pallof press variations. PRI has also increased our appreciation for the importance of core strength for health and performance. Two key core muscles, for example, are the internal obliques and transverse abdominis (IO’s and TA’s), which, among other things, (1) bring the ribs down and in (i.e., rib internal rotation), (2) assist with expiration, and (3) resist spinal extension. If you lack strength in your internal obliques and transverse abdominis, then you may struggle to keep your ribs in a position that allows your diaphragm to function optimally for breathing (i.e., maintain a Zone of Apposition). As we’ve discussed in previous posts, sub-optimal breathing patterns can worsen, among other things, cardiovascular health, autonomic state, and mental well-being, and may even explain why your neck is always tight. The internal obliques and transverse abdominis position the rib cage for optimal diaphragmatic function. Poorly functioning IO’s and TA’s may also impair athletic performance. Since these muscles resist extension of the spine, they are crucial for posture and movement: if the spine is in a hyperextended position, then, as per Fryette’s Law, spinal rotation and sidebending will be restricted. Thus, if you’re an athlete whose sport demands that you rotate and/or change direction (e.g., baseball, soccer, or hockey), then you better have adequate internal obliques and transverse abdominis function–while you might be able to lift an impressive amount of weight in the weight-room, whether or not your strength is effectively expressed in your sport might be largely influenced by these deep core muscles. In a cruel twist of fate, the rigor of athletes’ training often mal-positions and impairs the function of their IO’s and TA’s by strengthening the muscles that oppose them (e.g., paraspinals, psoas, latissimus dorsi). Thus, it may be especially important for athletes to emphasize strengthening and improving the function of these muscles in their training. Soon after our initial exposure to PRI, we had another simple realization that has since influenced our training programs: if you exhale fully during common core exercises, then the exercises will often be more challenging and beneficial than the traditional way you might perform them. Fully exhaling and holding the exhaled position for a few seconds (like an isometric contraction) increases the activation of the internal obliques and transverse abdominis, so you get a better training effect. Instead of programming exercises for reps or time (e.g., eight reps or thirty seconds), we often program an exercise for a specific number of breaths (e.g., five breaths). While the sets might not last as long when you perform the exercise with a particular breathing cadence, the quality of the reps might be much better. Take, for example, the Deadbug (video below), which was a staple of clients’ programs at Cressey Sports Performance when Peter and I interned there. If you perform this exercise with no attention to your breathing, then you might feel a minor to moderate engagement in your core. But when you exhale fully in the fully extended position, more often than not the exercise is more challenging, you feel your core working harder, and you perform the exercise with better form. If you haven’t tried this exercise before, then do a few reps to experience what I’m describing. Note that it’s perfectly normal for people’s cores to literally shake when they use the breathing for the first time, so don’t be alarmed if this happens to you. As a reflection of the aforementioned form alterations, Peter and I rarely call this exercise the Deadbug anymore–instead we call it the Dead Bug with Exhale to emphasize the exhale’s importance. Side Note for Trainers/Strength Coaches: the Deadbug with Exhale can be an excellent way to teach people how you want them to move and the posture you want them to have. When a person feels their lower back in contact with the floor and their core engaged during the exercise, make sure that they remember that feeling, since you can have them recall that position/feeling when you’re cuing them out of excessive extension in a myriad of exercises (e.g., rows, lunges, deadlifts, etc.). For example, if someone is performing a lunge with an overly extended posture, then you can tell them to exhale and remember their core positioning during the Deadbug with Exhale. I recommend that you have people do it as one of the first exercises in their warm-up so that they can learn this position/feeling and use it as a reference for exercises during the rest of their training session. There are numerous exercises in which you can incorporate breathing, so below are a few examples of exercises that Peter and I particularly like. A typical set of any of these exercises might be five or six breaths, with each breath involving a full exhale out your mouth and a three-second pause before inhaling through your nose or vice versa. The Prone Bridge with Posterior Pelvic Tilt and Exhale is a more challenging variation of a front plank/prone bridge. Its emphasis on posteriorly tilting the pelvis, reaching the heels back, and exhaling make it an excellent anti-extension exercise that gets people’s cores to shake with alarming consistency. The Kettlebell Pullover with Breathing is both an excellent anti-extension exercise as well as an inhibition exercise for the latissimus dorsi (aka the “lats”). 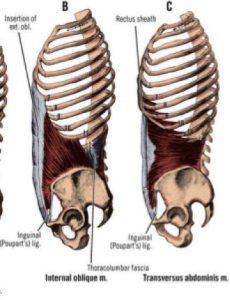 Tight lats are common among weightlifters and can contribute to anterior pelvic tilt, excessive spinal extension, and sub-optimal functioning of the scapula and humerus, among other things. This exercise might therefore be especially valuable for weightlifters (e.g., powerlifters, Crossfitters, bodybuilders, etc.). The Supine Band Pallof Press is another great anti-extension and anti-rotation exercise. By lying on the floor and feeling your lower back in contact with the ground, you ensure that you perform the exercise in the appropriate position and engage the deep core muscles. To resist the pull of the band, you must engage the core to prevent your spine from bending or rotating. As I mentioned in the video, there are different ways to incorporate breathing with this exercise. For example, you might hold the most challenging position for a single exhale before returning to the easiest position, or you could hold the most challenging for consecutive breaths. The former is less challenging and is therefore better for people who are doing the exercise for the first time, while the latter is a progression because the core muscles are constantly working at a higher intensity. If you have any questions or comments, then don’t hesitate to share them below!